WHO IS THIS GERMAN JESUS? Something has been agitating me for some time, and I want to get it off my chest. I hope this convicts some of you and encourages others. Recently, I was tuning a piano in an Episcopal church. I tune pianos to meet our family's needs, while I pastor a fellowship which meets in the homes. In the Episcopal church all purpose room was a picture of Jesus, and it was the most grotesque picture of Christ which I have ever seen. Jesus was depicted as standing by a fishing boat holding a net. The concept there was OK, but, friends, the demonic grin on the face of this alleged Jesus was horrid. It made Jesus look like he had just been given a furlough from "B" Ward of the State Mental Hospital. Now, I would fully expect Episcopalians to want a deranged Jesus, for they are deranged spiritually. They walk the pagan labyrinth, they gather in witches and queers as much as 50% of their local attendance, and Freemasons are exalted there. But, I have seen many other profane pictures of Jesus. There is the sick pasty gray Jesus of the Roman Catholic Church who is pulling His chest open to allegedly show His heart to the viewer. There is the hard faced 55 year old worn out married man of the Mormon Church, And, there is the Jesus picture of the Branhamites which they brag on because William Branham claimed God told him it was an exact copy of Jesus. Funny thing though-- Branham's Jesus still looks like a German Gringo white man, NOT a Jew. I also note the dead Jesus hanging on the cross in Catholic churches. Jesus is NOT dead-- He is risen and seated at the right hand of the Majesty on high. He will NEVER climb up on your filthy cross in the Catholic Church or on your wall in your home. His work on the Cross is finished, as He said in His own words as He died on the cross. What blasphemy. Also, we have all seen the plaster of Paris Jesuses being sold in Catholic book stores. These pagan trinkets also lend damage to the person of Christ in that hey give children life long mental imagery of God which is plastic and degrading. Turn over one of those plastic Jesuses you stick to your dashboard in your automobile, and you will realize it was made in Hong Kong by Buddhists. And, I bet you think that plastic Jesus will sort of add security to your travel. How stupid. How utterly stupid!!! Because of the profane attack on Jesus Christ in these false and degraded representations, I offer an alternative. I suggest that if you want to get an idea what Jesus looked like, go around to the nearest Orthodox Jewish synagogue. You see, Jesus WAS and IS a Jew. When Jesus Christ appears in power and great Glory at the end of the Great Tribulation, it will be to set up His glorious Kingdom with the Jews in restored Israel. Can you imagine that this Jesus will be Black or Chinese? Or will he look like Prince Philip strolling along with his hands behind his back? NO!! Jesus Christ will be easy to look at by any Jew in the vicinity of Jerusalem. NEVER in the Bible does the narrative indicate that even the hateful Pharisees complained that Jesus did not look authentic, very Jewish. 1. Show you that you should not have ANY pictures hanging around which allege to be Jesus. 2. Show you that, in the coming Kingdom of Messiah, you are going to be dealing with a Jew. 3. The White Race is NOT the measure of all things good and glorious. 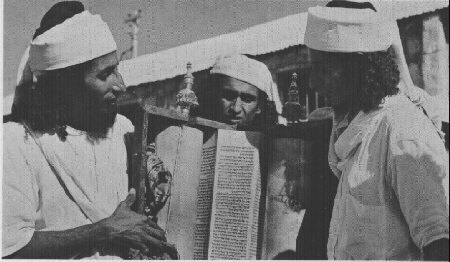 These are Yemenite Jews. I chose this picture because the Yemenite Jews were the least corrupted by outside blood over the centuries. Jews from Europe and Russia and the Slavic world had lived there for over 45 generations from the captivity of Israel to 1948. There was a lot of intermarriage, and the average Zionist today looks like an Anglo-Saxon hybrid. Jesus would have looked purely Semitic, and the three men in the photo would then look a lot like Jesus. I WANT my Jesus to look like a Jew-- I expect He will have hands like a carpenter, not a whiskey sipping IMF banker. 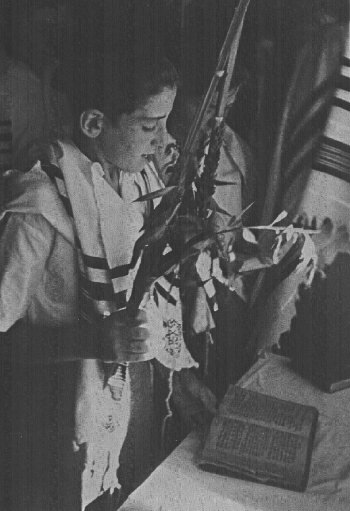 In the picture of the Jewish boy, you see the custom of letting a young man, one who has passed his Bar Mitzpha-- coming of age, as he is invited to read the Law. In this case, the young man is probably observing the Feast of Tabernacles. This would have been the experience of Jesus as a young man in the account of Luke, Chapter 2. So, read this chapter from the King James Bible, and contemplate the real Jesus of Galilee-- A Jew of pure blood line from father Abraham, the first Hebrew. Do you have a Gringo Jesus hanging on the wall of your home? Would you please consider taking the thing down, and learn to form your mental pictures of Jesus and the Bible characters by reading your Bible? I was on your website today and was reading about the German Jesus. I am in total agreement about these pictures. Of course, anyone who will but take the leisure of opening the Bible will find out Jesus is of the tribe of Judah, a descendent of the Davidic line, the son of David (meaning the Messiah) and the son of Abraham (meaning Jewish)...the Word was made flesh.... Jesus the promised Messiah of whom the Jewish prophets prophesied would come. When the Jews would cry out to Him "Son of David" they were acknowledging that He indeed was the Messiah. After Jesus' Resurrection, He was not recognizable. His own disciples did not recognize Him. To say He looked average, like someone in a local synagogue, might not be truthfully scriptural. During His earthly ministry, He said to Matthew "Follow Me" and Matthew left immediately and followed Him. John the Baptist said "Behold the Lamb of God which taketh away the sin of the world." The Bible tells us in Mark 9:15 "And straightway all the people, when they beheld Him, were greatly amazed, and running to Him saluted Him." Jesus' appearance was indeed Jewish but He was and is and always will be God, and Matthew followed Him because he saw in Jesus something that he had never seen in anyone before..."In Him was life; and the life was the light of men." The Bible tells us what Jesus looks like in Revelation in the Glory. According to Revelation 1:14, Jesus has white hair and eyes like flames of fire, feet like brass, voice as the sound of many waters... and His countenance is like the sun. When He comes back to rule, He is coming in great glory and every eye shall see Him. Again in Revelation 19:11 we see the same description..... many crowns upon His head. When John saw Him, he fell at His feet as dead! You might want to make mention of this verse in your article. There will be no mistaking Jesus for another. His appearance is exclusive and can never be mistaken. The Bible tells us in Revelation 20:11 that at the Great White Throne Judgement... "from whose face the earth and the heaven fled away".... The Lord's presence is awesome and all will know and recognize that HE is LORD over all! Whether or not He has carpenter hands or not is irrelevant.... the point is that He has nail prints in His hands and feet as a reminder to all who will behold Him that He alone paid the price for our sins on the cross and that He rose from the dead and lives forevermore. "Fear not; I am the first and the last: I am he that liveth, and was dead; and behold, I am alive for evermore, Amen; and have the keys of hell and death." Please do not display my email address on your website because of flakes who appreciate TBN and their blasphemous teachings.